Phishing attacks have become increasingly sophisticated. From tricking users into sending confidential information to crafting well executed emails that can slip past the most advanced technology, social engineering is still incredibly effective. This month we discussed this very topic and how organizations and their users should respond to phishing incidents. While the volume and consistency in which threat actors hit companies with these attacks varies, it only takes one click on a malicious link to expose the rest of your organization to a security breach that can potentially lead to data loss, reputational, and financial damage. There are a lot of things you can do to mitigate risk. For instance, having an internal abuse box that your employees can use to send suspicious emails can provide an extra layer of security. But what action is your organization taking after the email is reported? From an incident response perspective, time is essential. Blocking and analyzing threats in near real-time can remediate negative impact and help recover quickly from incidents. Additionally, promptly responding to employees that have reported the incident will encourage them to continue raising a red flag if they find something suspicious. Simply ignoring a suspicious email is not enough. A brief reply goes a long way. Not only does it provide useful feedback, but it also educates people on what they’re reporting. Was it a malicious threat? Was it spam? Establishing a system that rapidly communicates to your team about what to do next is critical to avoid potential data breaches. The longer you have an incident response in place, the more mature it becomes. By gathering all the information you’ve received from the reported emails - IP addresses, domain, suspicious threat actors, etc. - it will give you a broader picture of why and how your organization is being targeted. Better yet, it will help prevent similar incidents in the future. 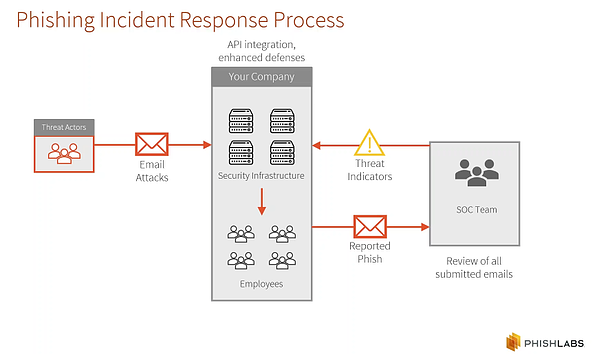 Learn more about the keys to an effective incident response strategy. Register for our free on-demand webinar were Evan Luck discussed how an adequate incident response can help improve your security structure and operations.